A delivery receipt confirms delivery of your email message to the recipient's mailbox, but not that the recipient has seen it or read it. A read receipt confirms that your message was opened. 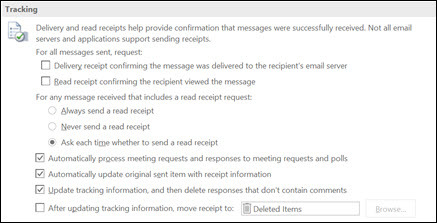 In Outlook, the message recipient can decline to send read receipts. There are other scenarios where read receipts are not sent, such as if the recipient's email program doesn’t support read receipts. There is no way to force a recipient to send a read receipt. On the File menu, select Options > Mail. Under Tracking, select the Delivery receipt confirming the message was delivered to the recipient's e-mail server or Read receipt confirming the recipient viewed the message check box. Tip: As a best practice, consider tracking only single messages of importance instead of all messages. Recipients who occasionally receive a notification that a read receipt is requested on your message are more likely to send a read receipt than if they are prompted every time that they receive a message from you. In a new email message, on the Options menu, in the Tracking group, select the Request a Delivery Receipt check box or the Request a Read Receipt check box. Open the original message that you sent with a request for a delivery or read receipt. This message is usually located in the Sent Items folder. On the Message tab, in the Show group, choose Tracking. Note: Tracking doesn’t appear until at least one receipt has been received. After you receive the first receipt in your Inbox, it might take several minutes before the Tracking button is available. Under E-mail, click E-mail Options. Under Message handling, click Tracking Options. Select the Read receipt check box or the Delivery receipt check box. Tip: As a best practice, we recommend that you consider tracking only single messages of importance instead of all messages. Recipients who occasionally receive a notification that a read receipt is requested on your e-mail message are less likely to turn off all read receipts for future messages. In the message, on the Options tab, in the Tracking group, select the Request a Delivery Receipt check box or the Request a Read Receipt check box. Note: Tracking does not appear until at least one receipt is received. After you receive the first receipt in your Inbox, it might take several minutes before the Tracking button is available. On the Tools menu, click Options > E-mail Options > Tracking Options. Select the Process receipts on arrival check box. Select the After processing, move receipts to check box. To select a folder other than Deleted Items, click Browse, and then choose your destination folder.